SANTA CLARA, Calif., Aug. 7, 2018 /PRNewswire/ -- Silicon Motion Technology Corporation (NASDAQ: SIMO) ("Silicon Motion"), a global leader in designing and marketing NAND flash controllers and solid-state storage devices, today released the SM2270, a complete PCIe NVMe SSD controller solution which offers high performance, high capacity, high reliability and low latency SSD storage for enterprise and data center applications. The 6th generation NANDXtend™ technology, which incorporates machine learning algorithms supporting Silicon Motion's proprietary high-performance LDPC error correction code (ECC) engine with RAID, ensuring better data integrity even in extreme operating environments. "The SM2270 is the world's first PCIe SSD controller that supports standard NVMe and Open Channel technology to be available in production. It draws on Silicon Motion's leadership position in flash controller technology and unrivaled knowledge of the data center SSD storage systems," said Wallace C. Kou, President and CEO of Silicon Motion. "This combination makes the SM2270 the ideal controller in SSDs for demanding cloud server and data center applications." 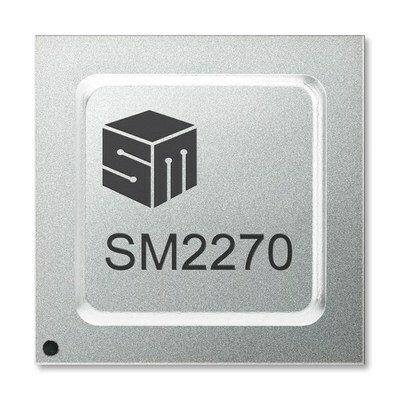 The SM2270 is available and in production now. It will be on display at the Silicon Motion booth #413 at the Flash Memory Summit (Santa Clara, California, USA, 7-9 August 2018). We are the global leader in supplying NAND flash controllers for solid state storage devices and the merchant leader in supplying SSD controllers. We have the broadest portfolio of controller technologies and our controllers are widely used in embedded storage products such as SSDs and eMMCs, which are found in smartphones, PCs, commercial and industrial applications. We ship over 700 million NAND controllers annually and have shipped over five billion NAND controllers in the last ten years, more than any other company in the world. We also supply specialized high-performance hyperscale data center and industrial SSD solutions. Our customers include most of the NAND flash vendors, storage device module makers, and leading OEMs. For further information on Silicon Motion, visit us at www.siliconmotion.com.